Washington state is updating its cannabis packaging and labeling rules. The Washington State Liquor and Cannabis Board (WSLCB) used information derived from a workgroup of I-502 stakeholders, the Department of Health, and the Washington State Poison Control Center to take a “global” look at cannabis packaging and labeling. They also included consumer surveys in the decision-making process. The WSLCB hopes these changes will make labels easier to read, easier to understand and less onerous for businesses. Businesses may begin updating their labels now, but all label changes must be in effect by January 1, 2019. One of the standout changes is the addition of a new universal symbol. The work group looked at universal symbols from around the country. 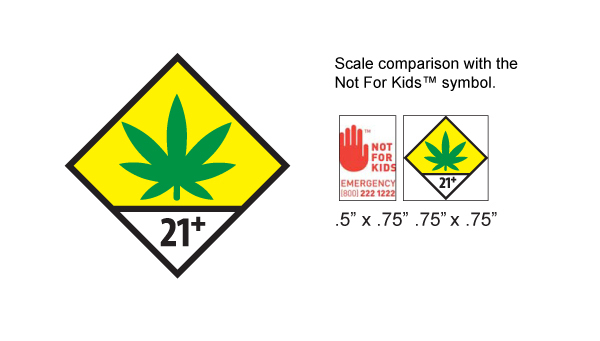 The new symbol will replace the warning labels “this contains marijuana” and “for use for people 21 and older.” Despite removing these warning notices, the new labels will now include an additional reminder that operating a motor vehicle under the influence of marijuana is illegal. Under the new packaging rules, processors can now sell lozenges and hard candy in child-proof, resealable packages. These will be approved on a case by case basis. Additionally, if a marijuana-infused beverage contains more than one serving, the bottle must be resealable. All infused edibles‘ labels must be reapproved by January 1, 2019. Finally, vendors may offer their accompanying materials, lab results, pesticide use, and other information related to cannabis production and manufacturing, via URL or UBC code, rather than providing them in print to the retail stores. The state has also updated their definition of what is appealing to children and the definition of a cartoon.